AV Audio & Sound Recorder helps user quickly and easily record live audio through various devices such as a microphone or any particular virtual audio component. Users are now able to record conversations from multiple Instant Messenger and VoIP applications, such as Yahoo, AIM, GTalk, Skype, etc. with the help of AV Audio & Sound Recorder. What makes AV Audio & Sound Recorder outstanding from other relevant programs? - Support simultaneously recording audio data from microphone and/or various input devices. - Record any audio file and save them in such popular formats as AAC; APE; FLAC; MP3; MP4; MPC; OGG; RAW; SPX; TTA; WMA; WV. * Installation requirement: AV Audio Converter. - Audio recorded by AV Audio & Sound Recorder can be directly exported to AV Audio Editor for advanced editing and morphing process. * Installation requirement: AV Audio Editor. - Sampling Rates and Bit Depth are processed with a high quality re-sampling and dithering method. 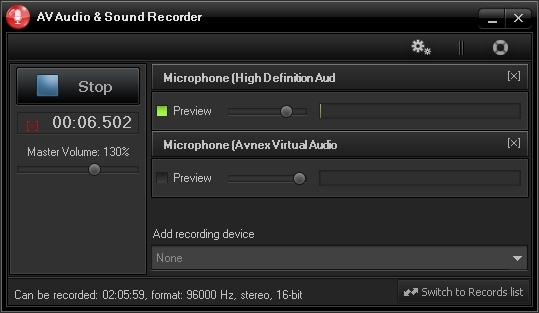 - Support recording and exporting mono or stereo clips with high quality up to 16bit (96,000 Hz). - Offer the ability to directly save recorded audio clips into .MP3 (lossy) format, or .APE (lossless) format. Saving a file in a "lossless" format helps user preserve the original recording quality.